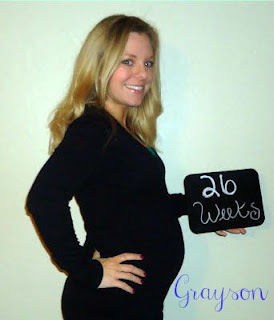 Miracle of all miracles, I have managed to post my 26 week update while I am actually still 26 weeks. I mean, if you want to be technical about it, it is technically after midnight, so I guess I'm officially 27 weeks right now....but I'm gonna say since I haven't gone to bed yet it can still count as Friday night rather than Saturday morning, yeah? Ok, glad we cleared that up. The past couple of weeks have been pretty uneventful, at least when it comes to baby. We've been gearing up for vacation, and we are super duper excited to get that started ASAP. We're staying in Texas, but we will be on the beach, so that will be a pretty wonderful week I do believe. Alright, on to the update! is inhaling and exhaling amniotic fluid, which is developing his tiny lungs. He's putting on fat now, which is making him look more baby-like and less alien-like. His sense of hearing is also getting stronger, so he can hear me and daddy talking to him, and is probably somewhat terrified by the tantrums he hears Grayson throw from time to time ;) He's getting close to two pounds and around 14 inches long. I'm starting to get tired much easier than I have been over the past few months. I wake up with all of these ideas and goals for the day and I do a couple of things and feel totally wiped out. It's making it difficult to get much accomplished! I'm starting to feel big...belly is in the way when I try to bend or lean forward, so it's making life a bit more difficult. I still feel pretty good though! I can't think of any actual symptoms I'm having on a regular basis, so fingers crossed things stay this great. 14 pounds, but to be fair, I did eat a huge meal and then a bowl of cereal right before I weighed so maybe less? Doubtful. Still moving like a little maniac in there! He's gotten to the point where if Daddy talks to him or taps on my belly he'll move around for him, which is fun. I like the fact that I can almost always get him to move. I always like to reassure myself that he's doing good in there. Pretty good. Pretty much waking up every night between 2-3 for a trip to the bathroom, and I wake up to switch sides a few times a night. But still pretty comfy and sleeping good! He's chatting with him quite a bit these days, and trying to get him to kick. We were just discussing the fact that he will be here like any day now....even though it will technically be around 3 months before his arrival, we know it's going to fly by so fast. One of the perks of having done this before is knowing that while three months sounds far, before we know it we're going to have a sweet little boy to bring home with us! The nursery is really starting to come together, which I love. We've got the walls painted, I've hung up the art on the walls, his "hand me downs" from Grayson are all folded and put away. We've still got several things that we need for him, but it's starting to seem more real! I also feel like we're getting closer with the name, although Daddy is still holding out.